Not sure which size to order? Check out our sizing guide. Currently out of stock. Shipping in 3-4 weeks. +Where do I purchase the service plan? Your service plan is purchased in the Link AKC app when you create your account and activate your collar. +Will this still work for me if I don’t have AT&T? Yes, the LINK AKC service plan is independent of your cell phone service plan and provider (Verizon, Sprint, etc.). AT&T’s nationwide network allows the GPS data captured by your LINK AKC collar to be sent to your phone anywhere in the United States. 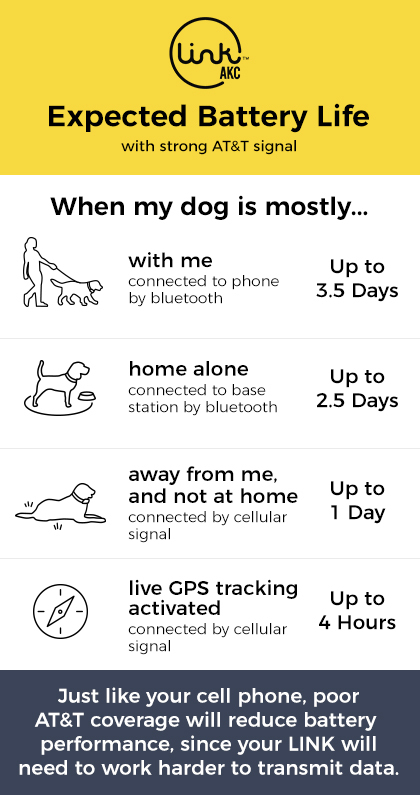 +How far can I track my dog? You can track them anywhere in the United States. As long as your phone and the collar have cell service (just like if you were making a call to your dog). The collar also has to have a clear line of sight to the sky for it to get a GPS signal. 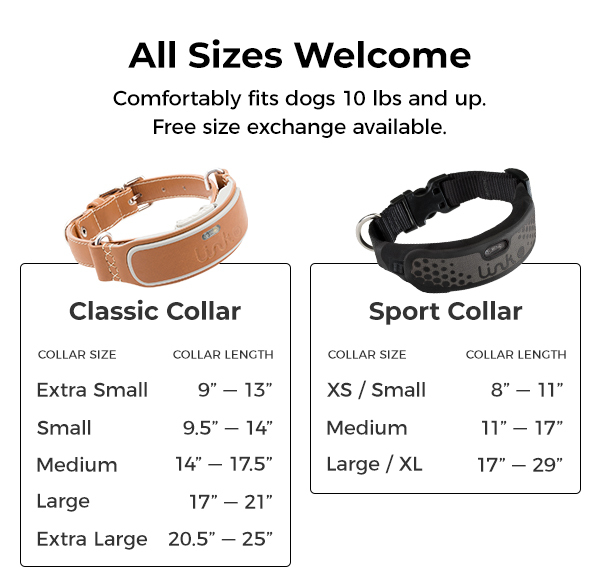 +How do I know what size is right for my dog? 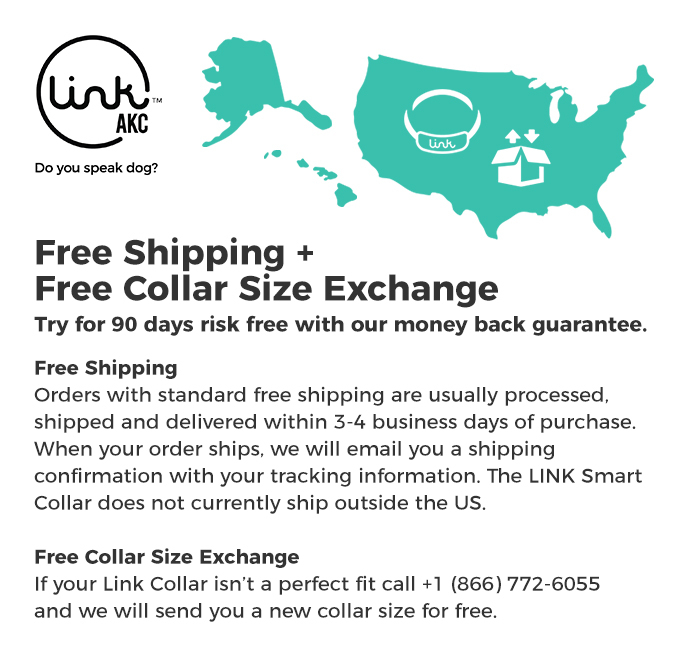 LINK AKC is suitable for dogs at least 10 lbs and unfortunately not for cats at this time. Below is a sample breed guide to help you determine the best fit for your pup but even if your choice is a little off, we’ll send you an exchange free of charge. Each LINK device needs a service plan to connect to AT&T, America's largest cellular network. 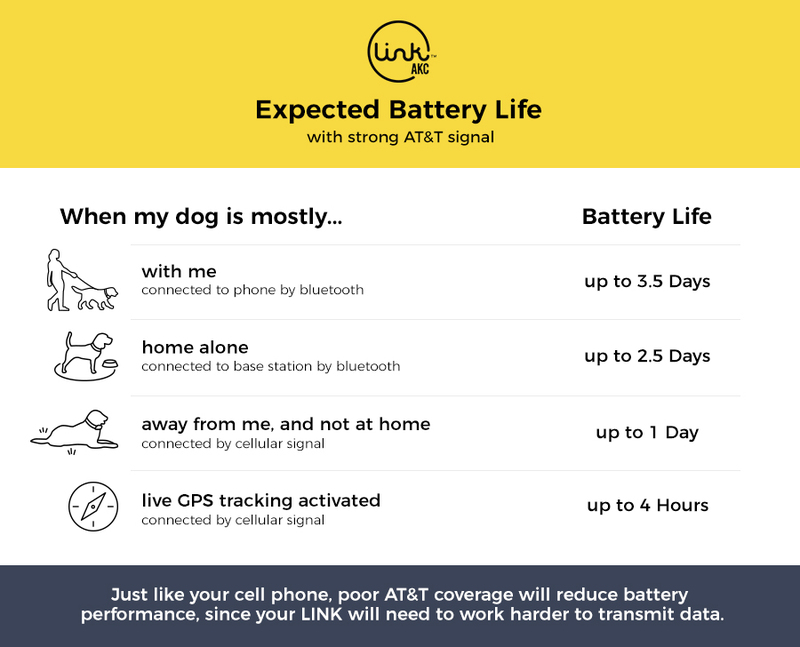 The service plan enables data to pass between the LINK device & app to pinpoint your dog's location, record activity & so much more. The $50 cancellation fee can be waived if service plans is cancelled within the 90 Day Trial window and product is returned as per the Return Criteria and Service Cancellation Policy above. get a free month of service. No thanks. I'll buy my Service Plan when I get my Link Collar.